A universal and secure intranet search reaches its end in the product life cycle. Google, the market leader in the field of Internet search engines, has been successfully making its technology available to customers in the enterprise segment for years. The flagship for the provision of this technology is the Google Search Appliance (GSA). Differences between Google Web Search and GSA search are always present due to differences in the framework conditions (especially regarding the amount of content and user queries). To close this gap, Google will offer a new cloud-based product to its enterprise customers in the future. In return, the GSA will be withdrawn from the market by 2019. In addition to the operational advantages associated with the use of cloud solutions, the new product will result in significant functional enhancements for customers in the areas semantic search, image search, video search, speech to text, alerts and assistants. Some GSA customers are unlikely to benefit from the new Google Cloud Enterprise Search due to internal policies. For this circle of customers, we offer suitable migration scenarios based on years of experience in the enterprise search environment. 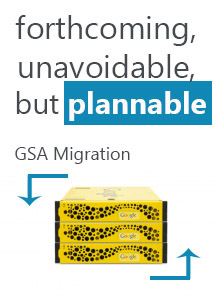 Existing search architectures based on the GSA must be restructured. We accompany you with the know-how from our many years of experience in the enterprise search environment. We introduce you to the possible migration scenarios in order to prepare a seamless replacement of the Google Search Appliance. This ensures the most important goal: applications that use the GSA search today get by with as little effort as possible or the necessary changes can be planned and implemented within the framework of regular adjustments. We understand how companies process information and live processes. We combine this understanding with our extensive experience with various search technology providers and show you a suitable solution to make the switch from the Google Search Appliance as easy as possible. You can look forward to individualized and personalized information systems that provide deep insights, efficient analyses and far-reaching cooperation based on company information. Even if the Google Search Appliance will disappear from the market in the foreseeable future, we will continue to support you as an Enterprise Search Partner. Be it with the new, cloud-based solution that Google promises the market or with another search technology. With our many years of experience, we will always find the right solution for your company.